Government Secondary School (GSS) Saratok, my home for two years. For about five years in the 1960's the Education Ministry built boarding schools well outside of the towns, on the theory the students would learn more if they were isolated from the distractions of the town. It made for dull evenings and a rapid turnover in the teaching staff. The theory changed, but they couldn't move the schools. Our school was about four miles from the town by the foot trail, and seven by the road. We had about 400 boarders and 100 day scholars. They lived at the school because it took some of our students a day and a half to get to the school, although most could do it in six hours or less. This is the view from our water tower. The headmaster's house, which was a year old at the time, is the white building with the green roof in the distance. To the right is the new dormitory, made of concrete, and to the right of it you can see a sliver of the moderately new two-story dormitory, made of wood. 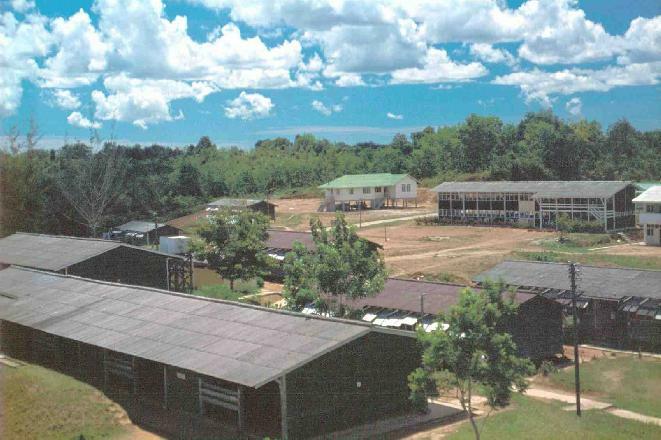 Below that are the old "Horse barn" dormitories, which show up again later, and a row of open classrooms, which also show up later.